Data weaves a ripping yarn. Product complaint analysis and reporting. A unique opportunity working with a local manufacturer, we were asked to analyse their data to help increase quality and reduce customer complaints. Much of this analysis was doing using ACL and Tableau data visualisation software that could be used by Senior Management to review. The analysis would be able to highlight trends spot trends that could be used to minimise return risk in the future. Below is an overview of some of the work we completed for this client. 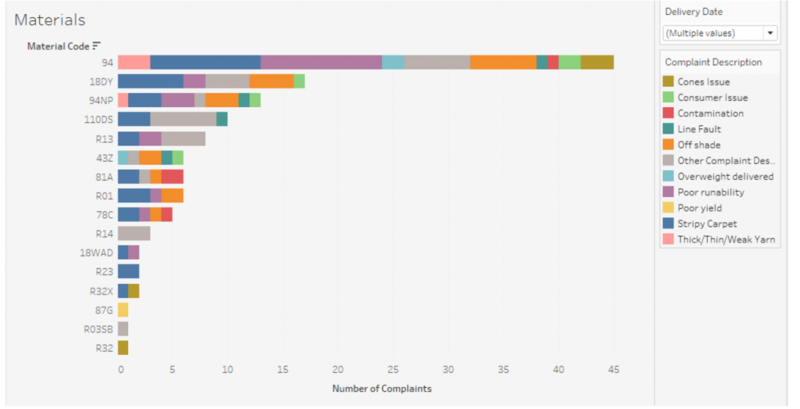 Analyse company production and complaints data, to see if there is any relation between the two, and provide a visual report for senior management to review and discuss in their monthly meetings. Gain insight into complaints that arise, show areas of improvement following production adjustments and areas where the team to focus more time into improving on. 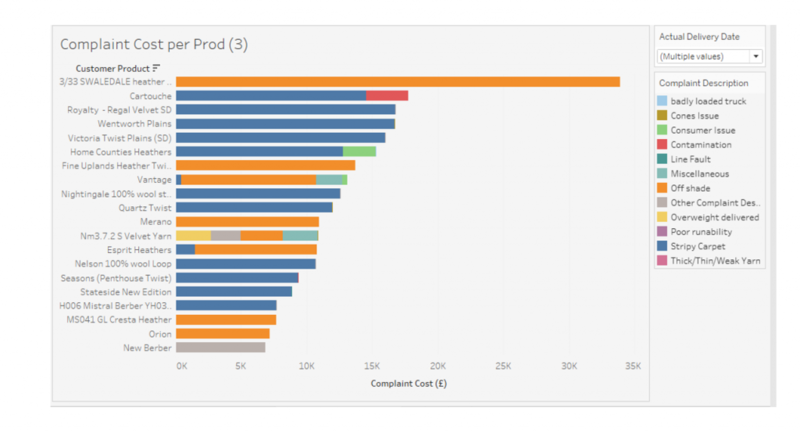 Using ACL Analytics and Tableau, applying joins and relations to combine data from various aspects of the production process to non-conformance incidents and customer complaints data. The project allowed the client to gain insight into where product issues may stem from, what their current leading complaints types are, and where to focus their attention to try reduce both complaints and the high value costs incurred by them. Output included creating a bespoke and interactive report in Tableau, to be produced on a regular basis for the client’s monthly quality meetings. Able to relate complaints right back to the materials (wool) used in the product at the start of the process. Allowed the client to gain insight into certain materials that appeared to cause more issues than others i.e. material 94 resulted in a higher proportion of “poor runability” complaints than other materials – leading to a possible link between the quality of the fibres in that material/batch than other materials used in their products. Approach: stripping a description field of punctuation, splitting the string into individual words and summarising the count of each word to see what keywords are the most common. Stop words: creating a set of stop words (the, in, at, and etc.) and removing these from the word cloud so that they don’t skew the volume of more important words. Additional words are added to the stop words set that are specific to the context of the client but were still irrelevant. Using the word cloud below, words jump out that provide some meaning to poor runability complaints i.e. blend, splice, weak, running, breaking, joints. Further analysis into other areas of production, such as materials used (see previous screenshot), reveal a possible link between a type of wool being poor in fibre quality leading to complaints reporting these keywords in return. Occasionally when a complaint is made against a product a cost is incurred, either through rebate to the customer or through cost to the client having the product rejected and absorbing the cost of production. 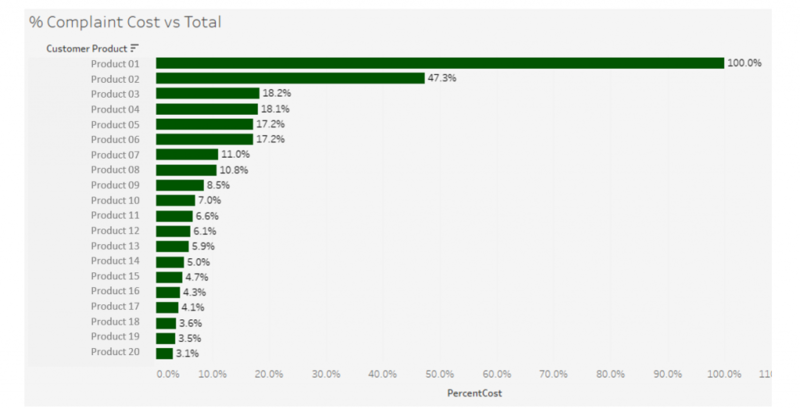 The visualisations below highlighted products which incurred the highest complaint cost in proportion to their total product cost, and then highlighted the complaint types that cost the most in complaints.